Every time I look at this picture, I think of Dr. Deming’s words to drive out fear and take joy in your work. We were talking in my home office when Sylvester saw a good lap and took it. Our conversation immediately shifted when both Dr. Deming and Sylvester started purring. The greatest statistical analysis is nothing if it can’t be implemented by people. But people learn in different ways. Some like good stories, others like pictures. Only a few like equations. 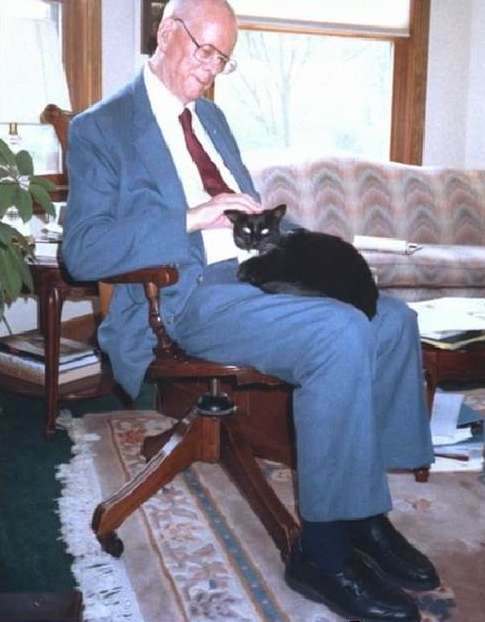 Dr. Deming always liked a good laugh; and a good purr. By what method do you get your analyses implemented? Bill Scherkenbach taught with Dr. Deming at the Deming 2 day seminars and received the Deming Medal and the author of several books on Deming management principles. This entry was posted in Deming, Psychology and tagged Deming, guest post, Joy in Work, photos, Psychology, Statistics on March 25, 2014 by Guest Post.